Click the button below to add the JBI Pro Perch Tech Specs to your wish list. Unlike stock spring perches that feature "fixed" holes for oil to simply flow through, the JBI Pro Perch is pressure sensitive meaning the port area (hole size) for fork oil to flow through is based on pressure. This "active" style of damping at the spring perch results in a fork that is plush on small bumps yet firm enough to soak up those hard hits & landings without being harsh. Why is "variable port area" important? While riding a fork is constantly generating different internal pressures based on the speed of how fast or slow the fork compresses. 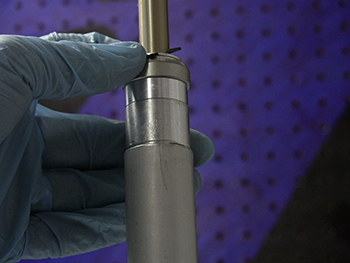 Because of this there are certain times when a fork benefits from a spring perch that has small restrictive oil ports, other times when the fork benefits from larger less restrictive oil ports, and every possible scenario in-between Therefore a spring perch with "fixed" ports is only performing optimally at one certain pressure (speed). 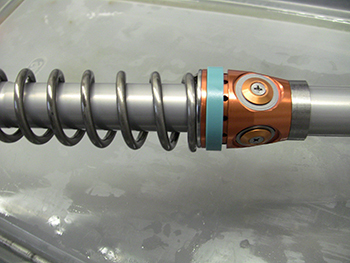 So in order to achieve optimal performance across the pressure (speed) range a fork generates a spring perch capable of creating "variable port area" based on pressure was needed. Does the JBI Pro Perch require revalving? In most cases, no it does not. 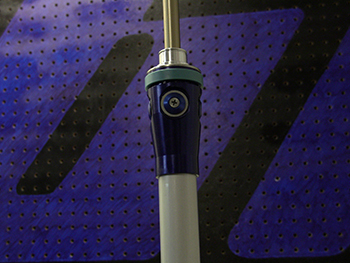 The JBI Pro Perch was purposely designed not to create any additional damping to contribute to the valving. Instead we want the fork cartridge (valving components) to still be the primary source of the fork feel/damping. Now some individuals may find they can go slightly softer with their current valving setup because their bottoming performance has improved so much. Why Create the JBI Pro Perch? There comes a point when modifying suspension valving that a tuner and rider must decide between a fork that is plush but bottoms out on big jumps/hits or a firmer fork that does not bottom but gives up plushness. 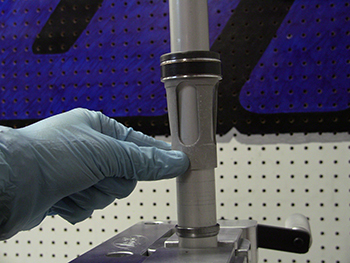 By utilizing a better performing "secondary" bottoming device that works independent of the fork valving the tuner can now setup the forks primary damping (valving) to be plush without sacrificing much need bottoming resistance. Is the JBI Pro Perch a solution for poorly setup suspension? NO! NO! NO! If you ride a bike that is grossly under-sprung for your weight purchase the correct springs first. If you ride a bike with suspension modified by that "one guy" who thinks he knows everything and your bike now feels totally out of whack the JBI Pro Perch is not for you. Instead call us, as a JBI Synergy Suspension Revalve would be the solution you are looking for. To put it simply, the JBI Pro Perch is not a solution for poorly functioning and/or setup suspension. The JBI Pro Perch makes stock and good suspension setups better. Can I change the perch valving? Ride JBI strongly and by strongly we mean STRONGLY advise against it. The JBI Pro Perch is assembled with a high grade MIL-Spec thread locking agent to prevent it from ever coming loose during normal riding conditions. If you heat up the perch to soften the locking compound the 7075 aluminum perch body will expand faster then the press fit Stainless Steel spring seat therefore compromising the fit. Also doing so will immediately void the product warranty. Instead call us and we can build you a custom JBI Pro Perch. What Oil Type & Volume does Ride JBI recommend? The progressive nature of the "Air Spring" affect is drastically reduced making the forks more linear and predictable throughout the entire stroke. The spring perch contacts the oil much later in the stroke providing the rider with longer plush travel then before. 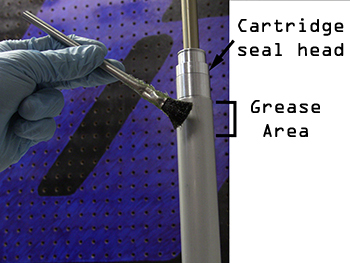 Mount cartridge upside down in soft jaw vice or find a friend willing to get their hands oily to hold the cartridge. 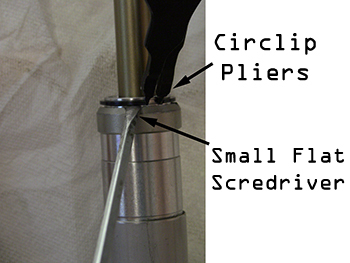 Use circlip pliers to GENTLY expand the circlip and a small flat blade screw driver to lift the circlip out of the groove. Do not over expand or force the circlip or it will not retain its original shape or strength. Slide on the JBI Pro Perch. 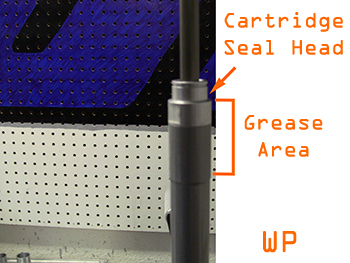 Again, some cartridges are slightly wider at the portion the cartridge seal head threads into the cartridge tube. If you are unable to spin/rotate the JBI Pro Perch on by hand you can lightly tap on the JBI Pro Perch against the stainless steel spring seat with a rubber mallet and while doing so be sure to alternate sides. As stated above this is a precision fitment part similar to a piston pin, so take your time and keep the alignment as straight as possible. Once the perch is past the point where the cartridge seal head threads into the tube the JBI Pro Perch will then slide easier into place. 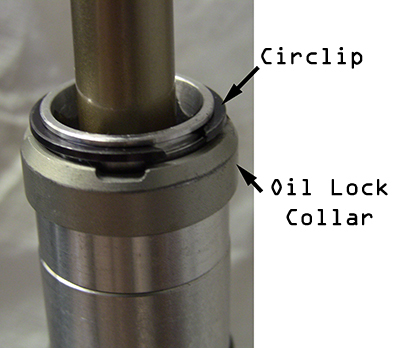 Put back the oil lock collar and the circlip that holds the oil lock collar in position. It is best to start one of the circlip ends inside the groove and while holding the circlip in place use your other hand to work your around the circlip pushing it into place. This method places minimal stress on the circlip. Pat your self on the back for a job well done and check out your new JBI Pro Perch. *Note: 2007-2013 KTM WP Twin Chamber forks remove the plastic white spacer that was located between the spring and orginal spring seat. This is no longer needed as the JBI Pro Perch features a stainless steel spring insert. 2014 WP Twin Chamber forks feature a black plastic spring seat and usually 2-4 white plastic spacers. To keep the intended amount of fork spring preload compare the height of the JBI Pro Perch versus the black plastic spring seat. To keep the same height you may need to remove 1 plastic spacer. 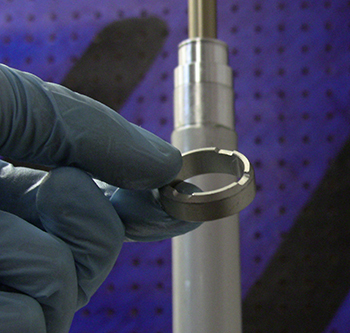 Assemble the fork as normal and when it comes time to fill the outer fork chamber with fluid pour slowly and press down on the top of the fork allowing the fork to slowly compress and rebound. 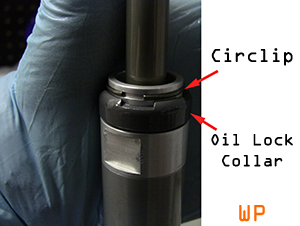 This will engage the rebound check valve to open up the oil return ports and you will see/hear the oil bubble as it goes to the bottom of the fork. Ride JBI recommends starting with an oil volume of 300cc for off-road and 320cc for Motocross. Remember pour slow and take your time so the oil does not over flow. 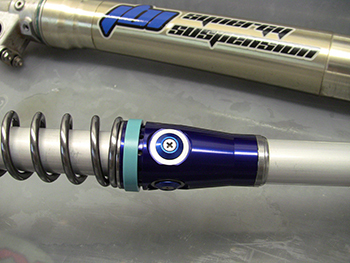 JBI Pro Perch WP Version http://www.ridejbi.com/jbi-pro-perch/ The JBI Pro Perch is a high performance spring perch upgrade for all KTM WP Twin Chamber forks and all types of riding (Motocross, Off-Road, Worcs). The JBI Pro Perch improves fork bottoming control and can also enhance overall fork feel. KTM dirt bikes are well known for plush but soft suspension that bottoms. The JBI Pro Perch allows to you to keep that plushness but add more bottoming control.